Equi-Bac Equine Oral Gel (Kaeco) Each dose contains 10 billion CFU of Lactobacillus species,enterococcus faecium, s.cerevisiae yeast, plus 100,00 units of Vitamin A, 20,000 units of Vitamin D3, 200 units of Vitamin E and 150 mcg's of Vitamin B12 It is a highest potency source of live viable naturally occuring microorganisms, yeast, enzymes and vitamins on the market. Equi-Bac is especially designed to be used on newborns, as the mare goes through a heat cycle at 3 to 5 days post birth, causing a change in the ph of the mares milk. This can cause a diarrhea condition in the foal. Equi-Bac is recommended for use in foals at this time. 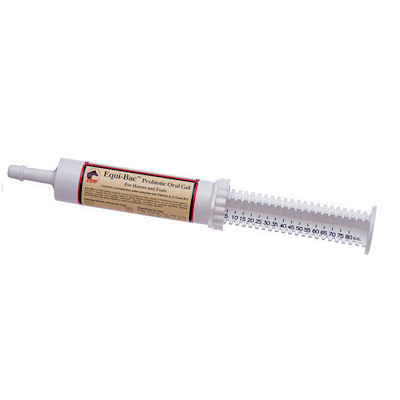 Usage directions: One 80ml Tube provides 8-10ml doses for foals. For Adult Horses use a 15ml Dose Daily. Recommended by most Vets to be used after your regular de-worming.